Manage your eCommerce store on the go with the Premium Edition Apps! The Premium Edition by WP EasyCart has quickly become out top selling eCommerce solution. With the Premium Edition shopping cart, you get everything we offer in one easy-to-use eCommerce solution. All of the features in our Professional Edition + 10 great extensions + phone/tablet apps! There is no better time to start selling online than today! If you are looking for the most comprehensive eCommerce solution for WordPress, look no further than the Premium Edition of WP EasyCart. One of the coolest features that EasyCart offers over the competition is our dedicated apps. All Premium Edition users can download to as many devices as they like our phone & tablet apps from Googles Play network or Apple iTunes. Phone apps let you quickly check orders & update order statuses. 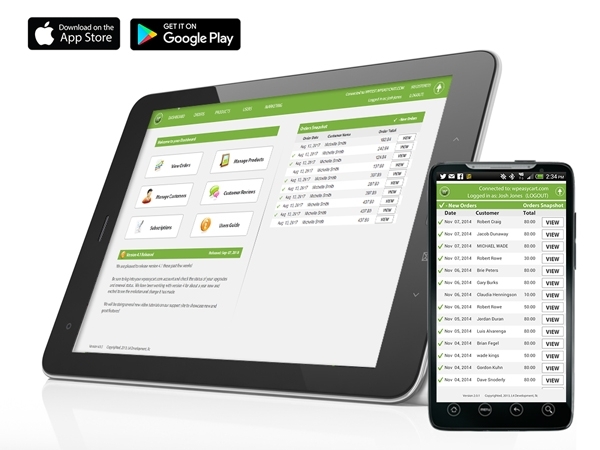 Tablet apps let you manage most aspects of your EasyCart system. Desktop apps let you manage your store without ever logging into WordPress from a PC or MAC. If you need remote management or staff need limited access, these apps can be a great tool to speed your business and supply chain.